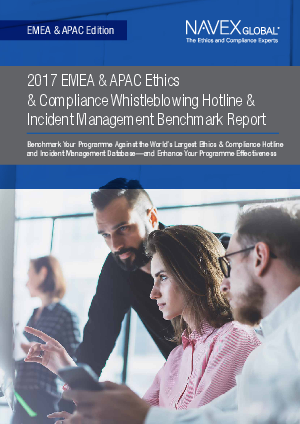 Good analysis and benchmarking of hotline data helps organisations answer crucial questions about their ethics and compliance programme. Comparing internal data year over year to help answer these questions is important. But getting a broader perspective on how your performance matches up to industry norms is critical. To help, each year NAVEX Global takes anonymised data collected through our hotline and incident management systems to create these reports. This particular report is the second NAVEX Global benchmark report we have published that focuses specifically on the status of ethics and compliance hotline services in the EMEA and APAC regions. This benchmark only takes reporting data from organisations that has its data warehoused in Europe—a subset of the data used in our global hotline report.